Today we’ll start our journey traveling north along the plain of Armageddon (“Har Megido” in Hebrew), at the Jezreel Valley. This enceinte cross road is where the last battle will take place, and it is on our way to Nazareth. Our first stop at Nazareth Mt. Precipice mentioned Luke 4:16-31 No visitor to Nazareth should miss the breath-taking panorama from the city’s highest point, about 2 km to the south-east of the city. The Mount of Precipice, also known as the Mount of The Leap of the Lord and Jabal Kufsi in Arabic, is traditionally the place in the Bible where the people of Nazareth took Jesus to hurl him into the abyss below. From here will drive through the slow traffic of Nazareth to Church of the Annunciation. 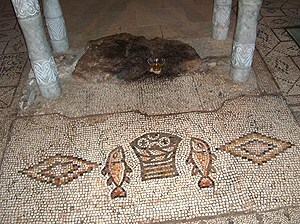 We’ll continue our drive north passing Cana of Galilee mentioned John 2:1-11 the marriage where the water was made wine. We can stop for a nice coffee shop with great view on the Sea of Galilee and Golan Heights . 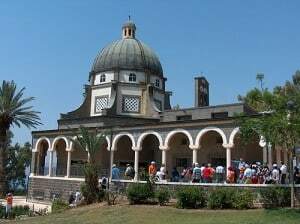 Short drive to Mount of Beatitudes were Jesus delivered the Sermon on the Mount. The solemn blessings (beatitudines, benedictionesOn the foothill of the mountain we have few holly Christian sites which consider to be the longest and happiestMinistry of Jesus period – Capernaum, Tabgha the traditional site of the miracle of the multiplication of the loaves and fishes Mark (6:30-46) and Church of primacy of peter. If time permit we’ll visit a small and unique museum at Ginosar The Sea of Galilee Boat museum”.) which mark the opening of the Sermon in the Gospel of St. Matthew (5:3-10). Finally short visit at Tiberias and Yardenit and here we’ll start driving back. To Jerusalem it is possible through the Jordan valley.